This 12-Volt Sealed Beam has Double Contact. It is 35 Watt. Has a 4.365 inch outside diameter. Early fender mount for tractors: TO35, MH50, MF50, MF65 Inner or upper fender for tractors: MF150, 165, 175, 180, 1100, 1130. Fits various other models. (L4411). Replaces 1002803M91, 1509347M1, 1751347M91, 1752866M91, 181856M91, 189544M91. 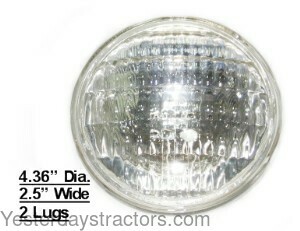 New, aftermarket Sealed Beam Bulb for sale with a solid manufacturer warranty. In addition, we have a generous 30-day return policy if this Massey Ferguson Sealed Beam Bulb for Ferguson 1080, 1085, 1100, 1105, 1130, 1135, 1150, 1155, 135, 150, 1500, 1505, 165, 175, 180, 1800, 1805, 235, 245, 255, 265, 275, 285, 35, 50, 65, 1001, 200, 202, 203, 204, 205, 2200, 2244, 2500, 302, 304, 406, 4500, 6500, 711, 811, 30, 30B, 30D, 40, 40B, 50A, 50B, 50C, 50D, TO35 tractors needs to be returned for any reason. Please see our Parts Warranty and Return Policy links on your left for complete details before returning.